Today’s post is twofold! 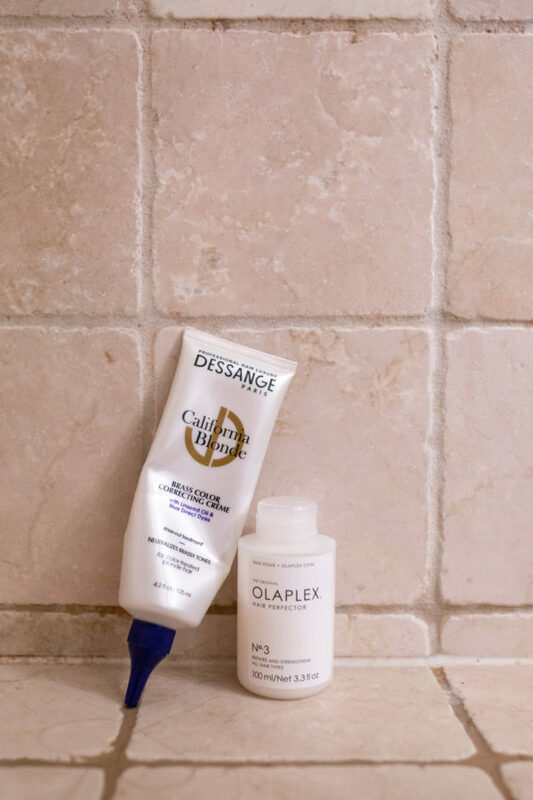 One – I’m sharing two of my must-have products for keeping my blonde hair bright, not-brassy, and strong & healthy, too. And two – as I was sitting down to write this post and grabbing links for these products, I realized that this purple color-correcting creme has apparently been discontinued. So for all of my fellow blonde ladies, I need your recommendations for something similar! I’d eventually like to get back to a place of being a bit more blonde than I am now, but keep some depth so it’s not quite as blonde as it used to be. But for the time being, it’s quite nice only having to go to the salon ~3 or 4 times a year, versus the 6-8 week rotation I used to be on! Alright, back to the products at hand! Olaplex is a three-part system that starts at the salon. If you’re going lighter or using any bleach in your coloring process, your colorist is most likely using Olaplex to prevent damage! But Step 3 is what I’m talking about today, as I’m not a hair stylist and don’t really know what specifically happens in the salon.  “Hair Perfector No. 3” is what you need! It’s the at-home treatment that strengthens your hair and restores so much softness… Think of it as a face mask for your strands! Even if you don’t color your hair — I’ve heard that Olaplex No. 3 is great for re-building from damage due to heat styling, too. I haven’t tried either of these new products yet, but Olaplex recently launched shampoo and conditioner, too! If you have tried it, let me know if I should or shouldn’t put it on my list for when I’m back in the states. Once you’ve got your hair healthy and strong, it’s all about the color. If you prefer those light, icy blonde hues, you’ve got to make sure that you’re keeping those brassy tones at bay! I’ve been using this Dessange Brass Color-Correcting Creme for a while now (the bottle has lasted forever!) and I really love it — I’m bummed that it’s apparently discontinued and sold out everywhere. I’ve searched high and low, but let me know if you end up finding it somewhere! I use this as a treatment in the shower about once every week! Purple masks and shampoos can make your hair super dry (something I already struggle with) so I try to space out the applications as much as I can. Depending on how crunched I am for time, I leave it on for anywhere from 3 minutes while I’m shaving my legs to 20 minutes when I hop out of the shower and do a face mask while it soaks in! It really does make *such* a difference. BUT… Seeing as it’s not available anymore, I’d love to get some of your favorite purple product recommendations! Shampoos, conditioners, masks… Any and all recommendations welcome. I love other Amika products so this Bust Your Brass shampoo + conditioner set could be a great option! (And they get a gold star for best product name ) I’m SUPER fascinated by these IGK Leave-In Purple Drops… You just mix them with any of your other products (like a creamy styling product) and apply. Have any of you tried these?? This O&M Silver Mask seems right up my alley and similar to the product I’m currently using. I also found this DPHUE Cool Blonde Shampoo & Conditioner, as well as this Sachajuan Silver Conditioner. Ulta also has this page on their website with a ton of tips for keeping your blonde toned! This Kenra mask or this Matrix mask both look like they could be viable options. I actually packed both of these products pictured above and have them with me in South America… So you know they’re must-haves! Get a glimpse inside my suitcase in this post, and check out this post for another one of my beauty favorites I have with me. Really?! I can’t wait to test these drops… I haven’t tried anything like them before! Thanks for the recommendation! I use the Kevin Murphy Blonde Angel (it’s purple) and mix it in with my regular shampoo and love it! Awesome, I’ve never tried this one, either! Thank you! I’ll report back when I do try this coming year. I love Madison Reed’s Crema gloss! Thank you!! I’m not familiar with the brand, but looking into it now. I love the Amika purple shampoo and conditioner. I was using a much pricier salon option that wasn’t doing anything, so I bought the Amika on a whim. My stylist even asked me what shampoo I was using since my blond stayed so icy between visits. Oh my gosh, that’s amazing news!! I’ll remember that next time I’m buying shampoo. Do you use it every wash or only once a week? Oliplex is fabulous! The new shampoo and conditioner are a must. As is the Oliplex #3. So good to know!! Adding it to my wish list. Thanks lady! Unite Blonda works pretty well (and smells like grape candy! ), but I find it’s not moisturizing enough for my curly hair. As a budget option, there’s a purple shampoo and conditioner in the Kristin Ess line at Target and I don’t find that one as drying. .
I’m new to the purple toning game, though, and interested in checking out some others! So funny you say that, I last had Unite Blonda per my colorist’s recommendation. I finished both bottles of shampoo and conditioner, but I did find it to be incredibly drying. I love how this Dessange treatment is so moisturizing! So, there’s still a bunch of it on ebay for crazy prices, but I feel like there’s nothing that compares, so stocking up!! I use the Perfect Blonde Shampoo and Conditioner and they also have a Perfect Blonde hair masque that I do about once a week. I don’t find this brand to be as drying as some others I have tried. Also Not Your Mothers Blonde Moment Treatment Shampoo is very hydrating and a good drugstore option. Not purple but the Jen Atkin Ouai hair mask is amazing!! I put it in before a workout class and then wash it out. I loooove the Surface Purple Shampoo. I only use it once a week and have also started using Lush’s Purple Conditioner Bar with it and the combo does an amazing job removing any brass I may have built up over the week. equally educative and engaging, and let me tell you, you’ve hiit the nail on the head.